Horse racing fans would have you believe that there are few sounds more magical than the sound of hooves thundering down the backstretch, horses shifting positions to get the fraction of a second edge needed to beat the competition. There’s nothing more stunning than a Thoroughbred at peak condition working in harmony with a rider — and there’s nothing more tragic than seeing that horse die on the track, which is why some former fans can’t even bear to watch racing anymore, because injuries and deaths on the track are becoming extremely common. The industry may refer to this as “breaking down,” but critics believe there’s a deeper problem here: Animal rights advocates question whether horses should be racing at all, and some argue that if racing continues, it’s in urgent need of reform, with 24 horses dying every week on American tracks. 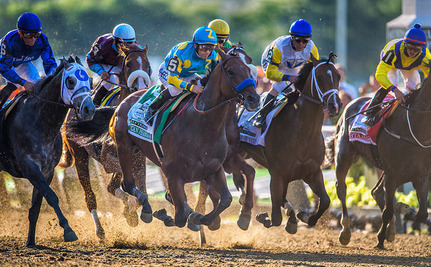 Just this weekend, American Pharaoh (misspelling and all) won New York’s Belmont Stakes, capturing the third jewel in racing’s famous Triple Crown and riveting the country. He’s one of only 12 horses to accomplish the grueling feat, and the first since Affirmed in 1978. But earlier in the day, something else happened on Belmont’s track: The latest of many horses to fall on the track was euthanized behind a screen. Helwan, the colt deemed too injured to rehabilitate, was the victim of an industry that some charge with overbreeding and the excessive use of performance-enhancing drugs that may be endangering the health and welfare of horses. In honor of racing’s equine victims, a list of those who’ve given their lives for sport — human sport, that is. This French colt was 4-years-old — older than many American horses (American Pharaoh is two) — and his race at Belmont was his very first start in the United States. After he broke his front left cannon bone during the face, his jockey pulled him up, waited for attendants, and walked off while the horse was assessed and later euthanized. Notably, it was his first race on Lasix, an anti-diuretic medication used on many U.S. tracks. Critics suggest that European horses typically race without such compounds, and the pressure to be competitive with horses in the States forces trainers to make poor decisions that endanger their horses. The kind of injury Helwan sustained is in fact treatable, though it can require surgeries, and a lengthy and costly recovery. Like many horses, however, Helwan wasn’t considered valuable enough to treat — in the cost-benefit analysis that overshadows racing, his owners decided that keeping him alive wasn’t worth the expense. Eight Belles captured the American spotlight when she entered the Kentucky Derby, fighting to be one of the few fillies who entered, let alone won, the race. Instead, she horrified viewers and the country when she broke both her ankles in an injury so terrible that she was also euthanized on the track. In the midst of the discussion about her case, it almost seemed like the United States was poised for racing reform, especially in light of comments from critics who noted that Eight Belles came from multiple lineages of horses with a history of severe track injuries and deaths, indicating that she might have been predestined to fail. However, racing officials made few moves to prevent cases like hers. A New York Times investigation in 2012 found that in the four years since her death, the industry was still plagued with dangerous working conditions, injuries and poor oversight. Kentucky Derby winner Barbaro wasn’t euthanized on the track at the Preakness, but he might as well have been after breaking a leg in three pieces, an injury so severe that it required 27 pins in surgery to repair. Racing contributed to the substantial foot and leg complications, including laminitis and infection, that led to the ultimate decision to euthanize him months after his treatment was clearly failing. Fans of the horse channelled their affection into a push to save retired racehorses from slaughter — a huge problem in the United States, where the industry has a massive surplus of unwanted horses. Del Mar Racetrack is one of the most dangerous places to be if you’re a horse, as evidenced just last summer when a record eight horses — seven of whom had to be euthanized, one of whom died of a myocardial infarction — died over a nine day period. Yes She’s Unusual, Chilled Mousse, Dance With Fate, Longview Drive, and the four other horses were all under the age of five: The age at which horses are generally believed to be mature. Being involved in grueling sports before full growth means that horses are putting stress on growing bones, muscles and tissue, creating strain many of them can’t endure; imagine an 8-year-old training to be an Olympic athlete. Australian racing favorite made it through the Melbourne Cup, but once he was put away in his stall, he collapsed, possibly because of a ruptured blood vessel. Like other athletes, horses pump a tremendous volume of blood during races, putting significant strain on their cardiovascular systems. Weakened vessels are vulnerable to rupture, and can cause clots that lead to aneurysms and other fatal conditions. While the racing culture in Australia is different than that in the U.S., the pressure on Admire Rakti to perform past his abilities mimics that seen on tracks in the U.S. This filly wasn’t even racing; she was just “schooling,” getting familiar with the business and the track. In what authorities called a freak accident, she spooked on her way to the starting gate, injuring herself so badly that she was euthanized on the track. Her trainer claimed that the injury was caused by a new sound system that broadcast the sound of the starting bell at an extremely high volume, startling the horse into the sudden movement that killed her. This filly, who died in 1975, may perhaps be the original Eight Belles, and the warning bell of the serious problems to come in racing. Considered one of the greatest horses of the twentieth century, Ruffian sustained a hairline fracture on the track, but was pushed to race again in an event called the “Great Match,” which pitted her against the year’s Derby winner. The filly’s injury, however, proved too much for her, and she destroyed the bones and tissue in her right front leg — all while trying to keep running. Her owners considered her valuable enough to attempt to care for her, and she underwent extensive surgery to repair the limb, but she woke up from anesthesia so agitated that it became obvious she wouldn’t tolerate the long recovery and rehabilitation period, so she was euthanized. Researchers like Sue Stover are working to make racing safer for horses, relying on data from actual track accidents and necropsies of horses. Addressing the problems with racing, however, may require aggressive legislative action, treating race horses like other animals in need of protection from cruelty. One might argue that pushing animals beyond their endurance, subjecting them to stressful environments, putting them on performance-enhancing drugs, and promoting traits like fragile legs that are more prone to snapping in races are all forms of cruelty, even if those involved in the industry genuinely do love horses and grieve when their charges die. I don't know why and how these races are still legal, and we call ourselves civilized? I don't think so! My heart aches for the horses -- if only each and every one of them would be treated properly with care, love and respect, I wouldn't be sitting here with this deep and poignant sadness I have for these magnificent, beautiful animals that do so much for their humans! With all the money around, a sanctuary should be set up for these horses with all the necessary accommodations a horse could possibly want -- shelter, food, medical attention, room to roam, places to socialize with other horses and humans, etc. I don't know how any decent, moral or humane human being can defend the atrocious horse racing (or greyhound racing) industry! Only a small percentage are treated well--until they are not. Most are overworked, easily injured, drugged and killed--many in incredibly heinous ways. Breeding should stop and wild horses left alone. Humans are selfish, greedy and cruel! It irritates me no end to hear the people say that these horses are treated like royalty, supposedly leading great lives and receiving good care. Yeah, they are treated like royalty, until they can no longer run or die trying. The horses are then discarded like an old shoe. This blood sport serves no purpose except to make money for the owners. It should be phases out as all cruel "sports" that exploit animals. Did you happen to notice the blood running out of the nostrils of Pharoah after the race? Not pretty.